Are you ready to move to a main level living home but you are not quite ready to downsize? I personally know that feeling. After looking at all of the adult communities ( or should I say 55 and older) in the Prince William County Virginia area I soon realized none of the floor-plans fit our lifestyle. We still wanted the flexibility to fenced yard for our dogs and were not quite ready to go along with the age restrictions for occupants in our home. Think about it. What if one of your family members needed to come home. Thirty days is just not reasonable. So we continued looking and that lead us to Potomac Shores. The house above is the same model we opted for. What we thought was a run of the mill, main level living home turned out to be a “Bungalow on Steroids” I mean seriously there is a reason these Chamberlin models sold out sold fast in Potomac Shores. The main level living floor-plan that Ryan Homes designed for Potomac Shores is not like any other home in Northern Virginia. This main floor living home offers a dramatic two story coffered ceiling great room with stairs heading to a loft bedroom, sitting room and full bath. The main floor has gleaming wood floors, an formal dining room, office, two and half baths, two bedrooms, laundry room, breakfast room, open concept kitchen as well as access to a huge screened porch and a deck. It does not stop there. The walkout basement is finished as well. If you are looking for a first floor master bedroom home that you not only need but want then put 17041 Silver Arrow Drive Dumfries Virginia 22026 on your list of homes to see. You won’t believe your eyes. 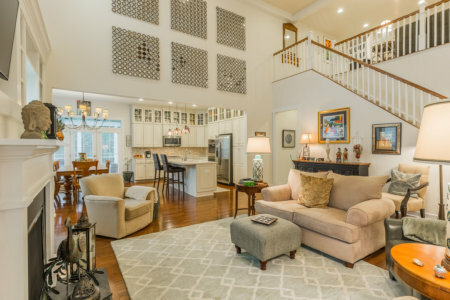 Check out all the other homes that are FOR SALE in Potomac Shores right now.